Curious to know if anyone is considering taking part in the Spanish version of L'Eroica this June. My wife and I were already committed to a visit to south-west France at that time so we have modified our travel plans to take in the ride. The Rioja wine region looks stunning and the nearby Basque food scene should make for a great week. Better bike .. Better life! The time has almost arrived - anyone else signed up? No but I look forward to your photo-heavy report. Rioja is indeed a beautiful part of the country. Sorry to say I won't be going, and most of the other forum members are likely not going either, but if you give a good ride report and lots and lots of pictures, well, this thing could be huge next year. So, no pressure, but remember that the eyes of the forum are upon you and the future success of this ride is riding on your shoulders! The Eroica Hispania website says that the Eroica Spirit is a mixture of suffering, pleasure, achievement and rest. My experience was that the first edition of the event delivered on that promise in spades – especially the suffering part. My wife and I rode the short route, advertised as 61km with 800 metres of elevation gain. The Garmin 500 I used says we rode 69km and did 1120 metres (this was a borrowed unit and I’m not sure how accurate it is.) We rode slowly with plenty of stops – for rest, water, beer, to take in the scenery, etc. - as my wife is new to cycling, but she did really well. Mercifully the day started overcast and cool and this lasted till about half way through the ride. Once the clouds burned off the temperature soared and reportedly hit 38C – hence a lot of the suffering. The course was interesting with great backroads through the countryside and vineyards. Lots of gravel early on took a heavy toll on tires for many riders. I managed to pinch flat both of my tires about the 30k mark, luckily near the first food / wine stop so refreshments were first and tire repair second. Other than that our bikes held up very well. There were some terrifically steep sections – both up and down – that we ended up walking, along with most others. There were 600 riders from 16 countries but it seemed most riders we encountered were Spanish or Italian. There were lots of Spanish bikes – Zeus, Orbea, Raseza, etc. - as well as many of the usual Italian marques. As a smaller event it was possible to meet both Giancarlo Broci, founder of L’Eroica, and the poster boy for L’Eroica, Luciano Berruti, who was a charming and accommodating man who didn’t mind posing for photos or talking about his bike, albeit in Italian, so I didn’t understand a word of what he said. 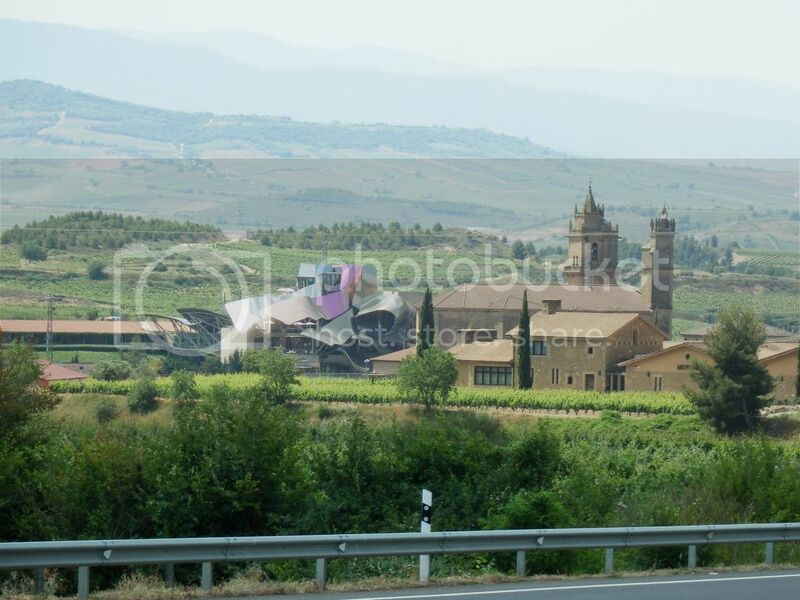 The Cinicero area of the Rioja is beautiful. 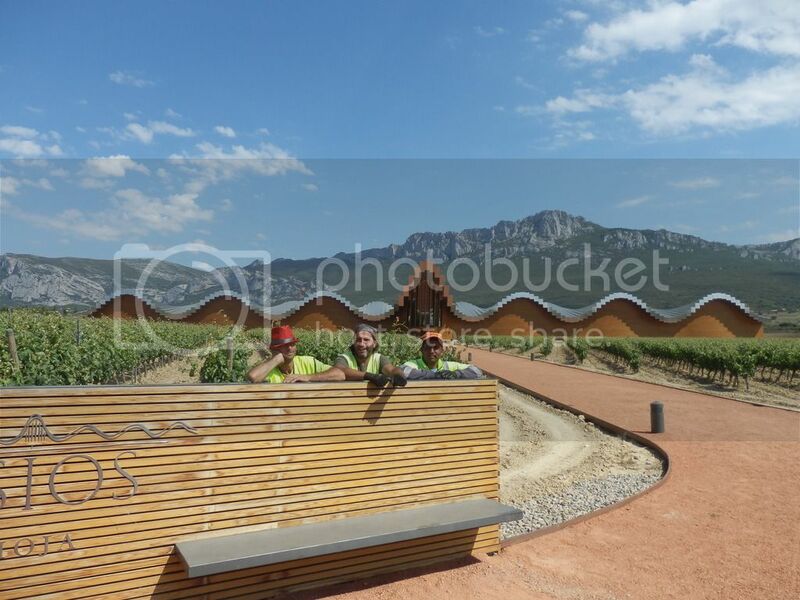 It has lots of very nice riding on quiet and nicely paved roads, picturesque villages (Guardia was a favourite), good restaurants (Alameda in Fuenmayor was very nice) and some world class modern architecture – Frank Gehry (Canadian) did the Marques de Riscal Hotel and Calatrava (Spaniard) did the Ysios winery. I commend the organizers for a job well done. All in all I would highly recommend Eroica Hispania. Universal Mod 61 Brakes - SQUEALING. To bend brake arms, or not?